The Paththirippuwa or Octagon of the Sri Dalada Maligawa, is widely regarded as the epitome or the most admired symbol and representation of Kandyan Sinhalese Architecture. It was built in 1802 A.D. by Devendra Mulachari, Master Craftsman and Royal Architect, on the instructions of King Sri Wickrama Rajasingha, who was the last King of the Kandyan Kingdom (1798-1815 A.D). The name ‘ Paththirippuwa‘ is derived from the Dravidian Language. It means – ‘ to sit and see all around’. ‘ Parthu’ means ‘to see’ and ‘ Irippu’ means ‘ seated’. The original idea for the King to have a new building constructed to enable him to have a sweeping view of the city, from an elevated height, was conceived by Dehigama Nilame. Early in point of time, where the Paththirippuwa stands, was the Mulpange, the kitchen of the Sri Dalada Maligawa, which was demolished. Under the authority of the King, Dehigama Nilame commissioned Devendra Mulachari (who had also been the royal artificer for the two preceding Kings, namely, Kirthi Sri Rajasingha (1747 – 1781) and Rajadhi Rajasingha (1782 – 1798) to design and construct the proposed building. The King was delighted and summoned the royal court to obtain their opinion. Unamboowe Nilame approved the structure, but suggested that its height should be lower than the height of the Dalada Maligawa, which housed the Tooth Relic of the Buddha. The building was completed in 1802. King Sri Wickrama Rajasingha was 22 years old at this time, and Pilimatalavuva was Maha Adikaram. This octagonal shaped masterpiece of Kandyan architecture provided an open space where one could walk around the upper middle room. The roof was an attractive lean-to roof or Hipped Roof with a steep gradient. The Paththirippuwa was meant to achieve four main purposes: to spend leisure time in comfort, to watch traditional martial arts like Angampora, elephant and other sports in the Mahamaluwa or the great compound, where he could listen to grievances of the common people who had assembled, and watch the splendour of the Dalada Perahera in ease and comfort. When the tooth relic was paraded in the Dalada Perahera the King would always descend to a lower elevation to watch the Perahera. The King rewarded Devendra Mulachari with many gifts. including honorific heirlooms like Pata – thaduwa (gold frontlet) worn on the forehead, and Nalal Pata (gold or jewelled forehead plate), and lands at Arattana, Kaudupitiya and Godapola in honour of the unique services Devendra Mulachari had rendered to the King, Buddha Sasana and the city of Senkadagalapura (now known as Kandy). Furthermore, Devendra Mulachari was offered a special seat in the Palace itself by the King, called Vastrasana, a seat usually given to eminent people. Devendra Mulachari also designed and constructed the moat running along the Dalada Maligawa, curved Walalkulu bamma or Cloud wall (2060 feet in length), which had the triangle openings in the wall to be used as a base to place coconut oil clay lamps to illuminate the area. The Diyarella Bamme with sharp crests underneath show a wave swell of the Kiri muhuda. It is built around the lake. Two to three thousand people are said to have worked at the lake site under the Rajakariya system and they were supervised by Migastenne Adikarum. Devendra Mulachari is also credited with the designing and construction of the Magul Maduwa or the Audience Hall, among many other novel architectural contributions. The story line is legendary. One evening when the King was walking on the Mahamaluwa together with his royal favourite architect and craftsman, Devendra Mulachari, he had expressed an ambition to build another Alakamanduwa on the lines of the legendary Kuvera”. Knowing the practical impossibility of such a task, Mulachari was thinking of a suitable reply, when he witnessed in the sky the pleasing sight of a rolling cloud formation over the original lake, which he eagerly pointed out and showed the King. Mulachari suggested a cloud wall be built around the Maligawa and the Paththirippuwa. With the King’s sanction the lake was constructed, by flooding the paddy fields or rice fields called Tigolwela belonging to the Malwatte Vihare, which connected the palace to the Vihare. Water from the Ampitiya side was diverted to fill the muddy field. Its extent was 19 hectares and depth was 18.24 M. This was completed in December, 1812. Another significant structure was a small island, known as the Kunda Saale or Diyatilaka Mandape, a miniature palace covered in Kokuuku, where the King spent his leisure hours during the hot weather along with his royal ladies. This was connected to main land by a unique collapsible bridge made to fold and unfold”. This was an engineering feat of high technical skill. Unfortunately this bridge was destroyed by the British Imperial Army in the wake of the First War of Independence launched by the Kandyan Sinhalese led by Veera Keppetipola in 1818. Occasionally the King used to go boating on the lake, where he had two flat bottom boats, and where he spent happy times feeding the fish. The Ulpenge, a bathing house for the queens which had a pond with fresh water with steps leading on to the lake, for which the cool water came from the springs and water falls of Udawattekele. Next, to the Ulpenge, there was a nelum pokuna which had fish and ducks. The Kandy Lake, which is in the heart of Kandy, adds a unique beauty to the city. It was called ‘Kiri Muhuda’ or the Milky Ocean because hundreds of white tortoises (Kiri Ibbas) were introduced to create a wave effect of the ‘Kiri Muhuda’. Devendra Mulachari contributed immensely with his talent and skills to beautify Senkadagalapura or Kandy City as it is called this day. This oil painting was done by Ms. Avanti Sri Nissanka Karunaratna, former student of Mahamaya Balika Vidyalaya, Kandy, an internationally reputed artist, bio – medical scientist, publisher, gemologist, geologist, and jewellery designer, and acting on the suggestion of Mr. Senaka Weeraratna, Hon. Secretary of the German Dharmaduta Society, Buddhist activist and Attorney at Law, who conceived the idea of the painting. Much of the information set out here has been gleaned from the historical research study ‘ Great Royal Artificer of the Kandyan Kingdom – Devendra Mulachari ‘ by D.D.M. Waidyasekera (former Commissioner of Inland Revenue), Colombo: Stamford Lake, 2017. 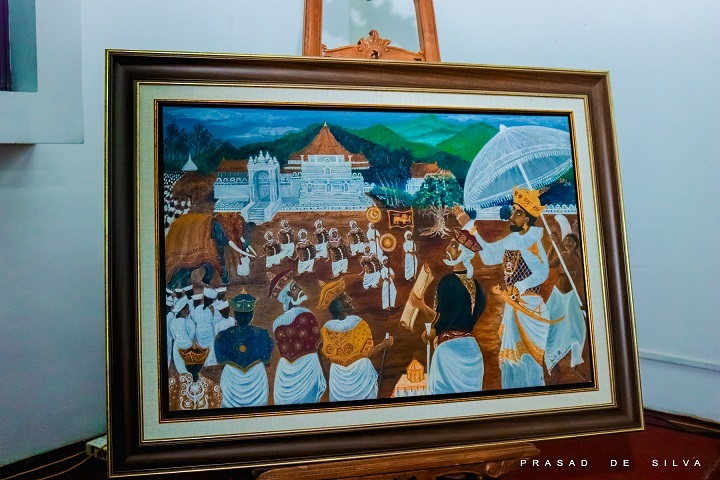 The Painting was handed over to the Diyawadana Nilame, Mr. Pradeeep Dela, at the Sri Dalada Maligawa on April 25, 2018. Thank heavens the British Colonials rescued us the Sinhalese from the Dravidian rule and they build the roads and we have a wonderful perahara. This entry was posted on Thursday, May 3rd, 2018. You can follow any responses to this entry through the RSS 2.0 feed. You can skip to the end and leave a response.